During the 1940s and 1950s, Glenrio sat very much alone in the open scrub desert of the high plains straddling the Texas-New Mexico border. Amarillo was 73 miles to the east and Tucumcari 41 miles west. Travelers driving Route 66 across the desert could see a world of stars at night, with Glenrio providing some of the only light pollution around with its diners, bars, western-themed motels, a dance hall, and gas stations. Glenrio was a flash of neon in the desert, an overnight Mecca, and a spot of evening cool in the days before cars had air conditioning. Straddling the State line, Glenrio began as Rock Island Railroad stop. Although part of the town was located in Texas and the other part in New Mexico, the Federal Government considered Glenrio to be a Texas town during those days. Mail would be dropped off on the Texas side of the border and then the station master would carry the mailbag to the post office on the New Mexico side for delivery. Glenrio was not a railroad town for long. In 1913, the Ozark Trails Association organized and began marking and promoting hundreds of miles of highways connecting several States, including New Mexico and Texas. Ozark Trails pioneered the transition from horse-drawn buggies and wagons to automobiles along America’s roads. By 1917, the Glenrio Hotel began receiving guests traveling by automobile along the Ozark Trail. At that point, trail was a good description of the Ozark. The crooked, dirt track was dusty in the sun and muddy in the rain. It had square turns as it followed section lines. Yet motorists came. By 1919, green and white Ozark Trail markers stood along the route through Glenrio. The Ozark Trail was incorporated into the United States highway system as part of Route 66 in 1926. By that year, Glenrio had essentially turned its back on the railroad in favor of the highway. Businesses near the railroad either closed or moved to be closer to the highway. 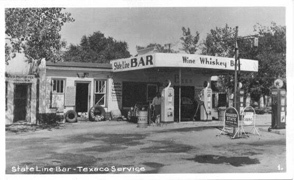 Several gas stations, a restaurant, and at least one motel were built on the northern right of way of Route 66 by the early 1930s. On the south side of the highway, a welcome station on the Texas side offered assistance--including water to cool overheated radiators--to motorists along the road. Local lore has it that the welcome station served as a film location for the 1940 movie, The Grapes of Wrath. This cannot be confirmed, but if location scouts didn’t choose Glenrio as a set, one has to wonder why. Even today, it’s not hard to imagine heavily loaded cars full of families leaving the Dust Bowl behind to seek a better life in California, their hopes pinned to Route 66. During the 1930s, Route 66 was transformed into a continuous two-lane paved highway across Texas. Several gas stations, a new restaurant, and a motel clustered along the north side of the road. A few buildings from Glenrio's rail-town past were moved close to the new highway, but most were demolished or fell into ruin. There were no bars on the Texas side of the community, since Deaf Smith County was dry, and no service stations on the New Mexico side because of that state's higher gasoline tax. During the 1940s, 50s, and 60s, travelers packed the highway and Glenrio thrived. Former resident John Paul Ferguson worked summers at Glenrio gas stations. He recalls constant traffic during the daytime, with cars lined up five or six in a row waiting to get gas. A new cluster of businesses were built during the 1950s. Two of them, a Texaco Gas Station and a nearby diner, are of particular interest today. Both were designed with Art Moderne influence. Look for the curved vertical panels on top of the drive-thru bay of the station and for curved concrete corner walls and a curved metal canopy on the diner. Both of these buildings are well preserved. Glenrio’s boom times ended in 1975 when Interstate 40 bypassed the town. It was listed in the National Register of Historic Places in 2007. 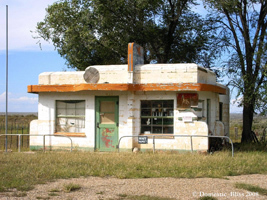 Today, the Glenrio Historic District includes the old Route 66 roadbed and 17 abandoned buildings. Most of the buildings are utilitarian with concrete foundations, stucco walls, and flat roofs, but several of the buildings are distinctive. You can still identify the Little Juarez Diner, the State Line Bar, and the State Line Motel whose sign reads “Motel, Last in Texas” to travelers arriving from the east, and “Motel, First in Texas” to traffic motoring into town from the west. Only two Glenrio buildings are occupied--the Joseph Brownlee House and an office in the Texas Longhorn Motel. Other buildings have overgrown sites, missing windows, or debris surrounding them, the detritus of four decades when Glenrio welcomed tens of thousands, fed and entertained them, and sent the on their way toward Chicago or California. It’s well worth the detour to get off Interstate 40 and cruise Route 66 through Glenrio. Crossing the State border in one of the country’s best preserved mid-century ghost towns evokes some of the adventure motorists from decades ago felt when the traveled long stretches of two-lane blacktop through the American West. The Glenrio Historic District includes the Historic Route 66 roadbed, also called State Loop 504, and properties north of it in Glenrio, TX and NM.